He may have his first serious girlfriend and be turning 18 next month, but Justin Bieber is still a little bit of a child at heart. The singer enjoyed all the fun of several arcade games at a Chuck E. Cheese venue in Los Angeles earlier today. 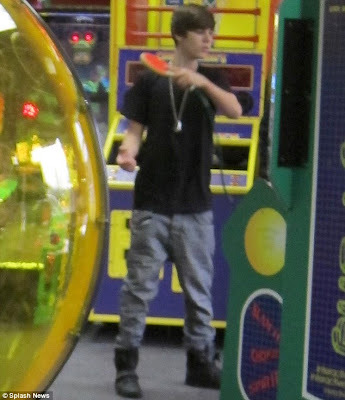 He was spotted having a great time with his girlfriend Selena Gomez, and his two younger siblings and father at the children's arcade and diner chain. Wearing a black T-shirt and baggy grey trousers, the star was absorbed in a solo table tennis arcade game before trying his hand at a few other amusements. According to Hollywoodlife.com, the famous couple were treating Justin's four-year-old half sister Jazmyn and half brother Jaxon, two. 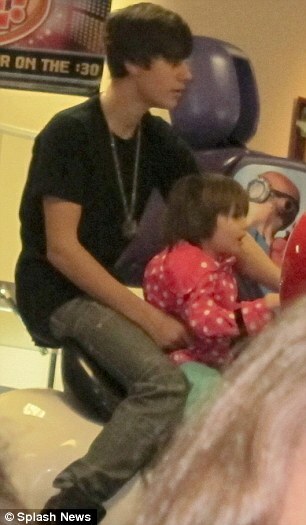 A source told the website that Justin took a delighted Jazmyn on the Barney ride three times. Meanwhile Selena seemed happy to shepherd two-year-old Jaxson through the venue after arriving around lunchtime. 'Justin and Selena were so incredibly sweet and thoughtful,' a source told the website. 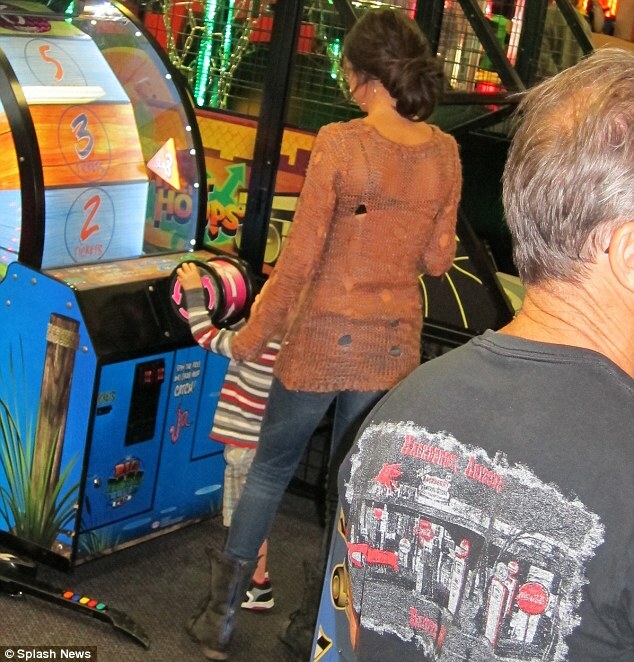 Dressed in a long coral pink knitted top and jeans, with her dark hair in a chic updo, the singer supervised little Jaxson as he reached up to play the games and giggled with Jazmyn as she drove a bright yellow play car. 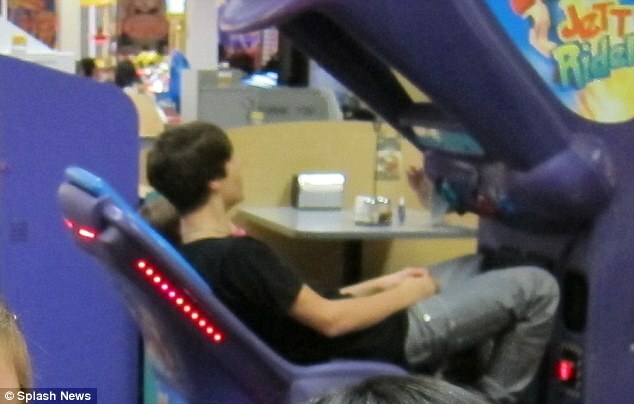 The pair played joined the children on the amusements throughout the afternoon after sitting down to a lunch of pizza. 'They all seemed really happy and down-to-earth. They all split a cheese pizza,' one onlooker said. 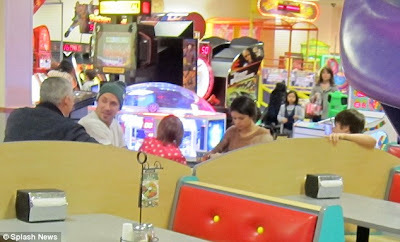 The celebrity couple also seemed happy to sign autographs for young fans in the colourful diner, with Justin donating some prize tickets to some visiting youngsters. 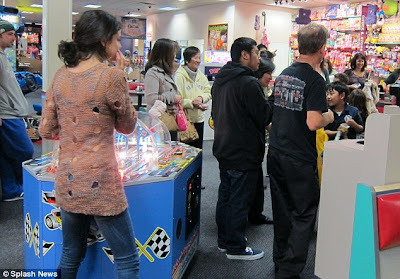 One on-looker said: 'Justin and Selena were racking up tickets for prizes, but they gave them all away to the other kids in the restaurant, saying that they didn't want them.